Okay, the headline is all clickbait. 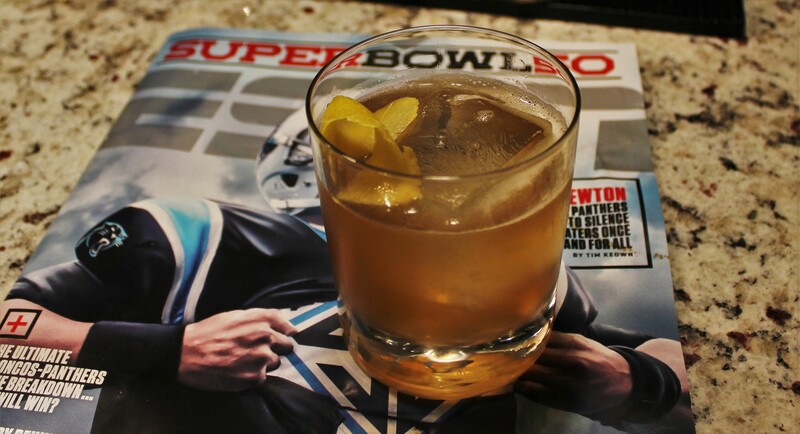 This isn’t the “official” cocktail of Super Bowl 50. But it is pretty damn tasty so I’m not sorry. The recipe is several paragraphs down, so if you’re not into reading words, just slide on down as you please. Father Time is undefeated when it comes to taking down the greats. Peyton Manning, who will turn 40 a month or so after the Super Bowl, is no different. Without question, his legacy will forever be a point of discussion whenever the conversation of record-setting, greatest-of-all-time quarterbacks surfaces. But the version that we witnessed hack defensive coordinators for years and reign supreme in nearly every quarterback metric won’t be available for Sunday’s game. In his place we’ll have a player who has an open invitation from every NFL front office; one whose career path has been awe-inspiring historically, physically and emotionally. And one who won’t be swept away by time. It’s only fitting that we’ll get to witness the legend fulfill his destiny and finalize his legacy on the biggest of stages, against the biggest of odds. By all rights, he should be the highlight of Super Bowl 50. But the biggest narrative, the most entertaining narrative surrounding the Super Bowl, isn’t Manning and his legacy. It isn’t about the discussion of where he will rank should he emerge victorious after the final whistle blows on Sunday night. No, the light that shines the brightest is none other than Cam Newton and his teammates. From making fans for life to obliterating opponents on both sides of the ball, the Panthers have done everything right in 2015. Incredible. Even more incredible is his 45 total touchdowns, which are the seventh most by a single player for a single season in NFL history. In fact, his last five years are basically the greatest ever by any quarterback. But it takes a person of great emotional balance and strength to endure a life as the darling of the country’s most popular form of entertainment. On a journey that could end with yet another record, Newton’s grasp of his significance off the field is just as impressive as his dominance on it. This is important, because there’s a generational divide driving a narrative that’s difficult to summarize in post-racial America. And even though what we’re discussing here is “only football”, that same divide plays a major role in the upcoming presidential election. So let’s, with open minds, acknowledge the glaring demographic parallels at play here. At the very least, let’s appreciate that if Newton had the same off-field troubles as Manning in his past or present—regardless of validity or significance—those troubles would be at the forefront and not just a part of town everyone avoids. But I digress. We’re supposed to be talking about cocktails. So let’s do that. This, That and the Third is a classic southern expression often used by Newton himself, who was born in Atlanta, Georgia. It only makes sense to design a cocktail centered around the flavors and culture of the South as our representation for the Super Bowl. I know what you’re thinking. You’re thinking this is just a spike Arnold Palmer. And it is sort of. However, the balance of bourbon to sweet and the added layer of peach steers this drink into more of an old-fashioned variation. In the end, you have a perfect summer Southern classic: bourbon, sweet tea and peach. If you want to make it truly Southern, use sorghum syrup instead of sugar to make the sweet tea simple syrup. I tried this initially, and didn’t mind the results, but sorghum is an acquired taste so I figured regular sweet tea would be more of a crowd pleaser. Note, also, that if you’re a bourbon lover, feel free to cut the simple and lemon in half and allow the bourbon to be the MVP. Cheers! Vegas twitter accounts already had lines set upon entering the fourth quarter of the NFC Championship game, with the Panthers favored by four points. Since then, with overwhelming amounts of cash coming in on the Panthers, the line has moved two points to -6 in favor of Newton and Co. For perspective, that’s the biggest spread since the Steelers were favored over the Cardinals in Super Bowl 43 seven years ago. Reflective of that, I haven’t heard a single person, either in real life or on TV, pick the Broncos to win. In fact, there’s a large faction of folks that think this is going to be a blowout. I’m not one of those people. It helps, when your quarterback can’t be asked to carry the team, to have the best defense in the NFL. How lucky are we as viewers and fans to see the best defense take on the best offense for all the marbles? Maybe the NFL is fixed. In any case, the Broncos narrowly slipped past the Patriots a couple of weeks ago. But that narrow victory showcased a coaching clinic put on by defensive coordinator Wade Phillips. In fact, in both of the Broncos playoff games, he has programmed the perfect game plan to stop two of the best offenses of the league in back-to-back weeks. Granted, those teams had major injury problems and obvious traits to exploit. The Panthers offense has so many variations and not a single point of attack that they rely on week after week, other than the quarterback, of course, making them almost impossible to game plan for. Their most obvious target is tight end Greg Olsen. We saw the Broncos put their best corner back, Chris Harris Jr., on Rob Gronkowski occasionally a couple of weeks ago, and even double him with safety help, but he still managed eight catches for a 144 yards and a touchdown. Olsen isn’t as good as Gronkowski, but he’s healthier and one of the best in the league. My bet is we see Phillips attempt to take Olsen completely out of this game. If Phillips is successful, he’ll remove 18.8 percent of the Panthers offense—the number of yards Olsen accounted for during the regular season. In fact, his 1,104 receiving yards accounted for 28.7 percent of Newton’s passing yards. Even so much as cutting that production in half will tilt this game. But the reason the Panthers have been so successful is their ability to evolve as on offense. Even if you successfully remove Olsen, like the Buccaneers did in Week 4 (two catches on six targets for 28 yards), it doesn’t guarantee the offense will stumble (the Panthers won that game 37-23). So let’s just say they hold Olsen in check; next step: attack left tackle Michael Oher. Oher has been nice story but I wouldn’t want to be in his shoes on Sunday when he faces Demarcus Ware. The Panthers have a tendency to use heavy formations with multiple backs and/or tight ends, and often use just two receivers, which means more protection and help for the offensive line. If that’s the case on Sunday, the Broncos defense could end up being the MVP. They have one great and two good cornerbacks to use in man coverage, and four solid pass rushers to eat into that max protection. If their pass rush is successful in the early goings, the Panthers will be forced into three-wide sets, which results in less protection for the quarterback. Then we’ll see how well Newton operates when given a questionable pocket and the teeth of the defense awaiting him should he choose to leave the pocket. I truly believe the Broncos defense has what it takes to at least make this offense look normal. But on the other side of the ball, Manning has to be perfect. The Panthers secondary features an elite cornerback in Josh Norman who will remove one receiver entirely. And their pass rush—the one that just came away with three sacks and seven turnovers against the Cardinals, the second best offense in the league—will be licking their chops to get after an immobile quarterback. The Broncos won’t be able to sit back and ride their running backs. They’ll need to mix up formations and move players around and attack the middle of the field. Manning’s ability to throw the ball deep won’t matter in this game, so it’s in their best interest to utilize short throws that lead to yards after the catch. I said I wasn’t one of the people that thinks this game will be a blowout. I think it’ll be a great game… for three quarters. As both defenses wear down, the advantage slowly favors the Panthers offense. As good as Ware is, he’s also 33 years old and nowhere close to having the dominant presence he had in Dallas several years ago. And even if Harris takes out Olsen or the Broncos corners press the Panthers receivers, let’s not underestimate how good Newton is, and how quickly this offense can explode—even against an elite defense that has virtually no weakness. I don’t want to over romanticize here, but I think it’s important to understand the gravity of the situation: we may be witnessing the one of the greatest quarterbacks ever, and a blueprint for what the future of the game will look like. Newton is unlike anything we have ever seen. He’s fast. He’s big. He’s accurate. And after a couple of so-so seasons, he is playing at a level we would expect from elite quarterbacks. There’s a reason why this team is 22-2 in their last 24 games dating back to last season and including the playoffs. He has faced some of the best defenses in the league this year, including Seattle twice, and hasn’t even winced. This, all without his best receiver who was injured before the season started. So even if the Broncos defense shuts down the top receiver and the tight end, and even if they bottle up Jonathan Stewart—one of the most underrated running backs in football—they still have to account for Newton somehow. His receivers may not pose the biggest threat to this secondary, but Ted Ginn Jr. has looked like a legit No. 1 with Newton throwing him the ball. Even Jerricho Cotchery is enjoying a late-career surge in the Panthers offense. Sprinkle in Corey Brown, who is one their most consistent receivers, and you have a well-rounded group of pass-catchers. But the X Factor is rookie Devin Funchess. He didn’t get a lot of playing time this year as he learned the offense, but his threat in the red zone as a 6’4” 230-pound receiver will be a difference maker in the Super Bowl. In short, the Broncos defense shutting down Newton is the only way they win. That much is obvious (who am I, Phil Simms?). But even if they’re able to slow down this offense and keep pace on the scoreboard, they’ll need to protect their quarterback and somehow move the ball against this defense, which allowed the sixth fewest points and sixth fewest total yards in the regular season. And although the Broncos offense has been efficient in the playoffs, let’s consider the defenses they faced. The Steelers secondary is one of the worst in the league yet, the Broncos managed only one touchdown and were forced into five field goals. Furthermore, it took a defensive fumble recovery for them to even take the lead. Then, in the AFC Championship, they took on a good-not-great defense and were a two-point conversion from being forced into overtime. In fact, were it not for a fluky missed extra point, we would have been pretty much guaranteed overtime. They managed to sack Tom Brady four times and force two interceptions, yet barely won the game against a team that had a terrible offensive line, a ton of injuries and absolutely no running game. Offensively, the Broncos managed just three points in the second half. That is not going to work against the Panthers. Bold Prediction: Manning is knocked out of the game after taking a hard hit and the last pass attempt of his career is an interception. Your writing never fails to amaze me. I can’t wait to see what you will write when our beloved Cowboys get back to the Super Bowl. Hopefully it’s in our lifetime ?. Cheers to a great game! Great analysis, great read! And despite all the challenges, I’m still rooting for Peyton and the Broncos . . . mostly Peyton maybe. I REALLY hope your Bold Prediction is wrong! Let’s hope I’m wrong about that!